RACINE, Ohio — The Lady Eagles couldn’t pull off the sweep, but they did manage to do something that no team has been able to do for a while. 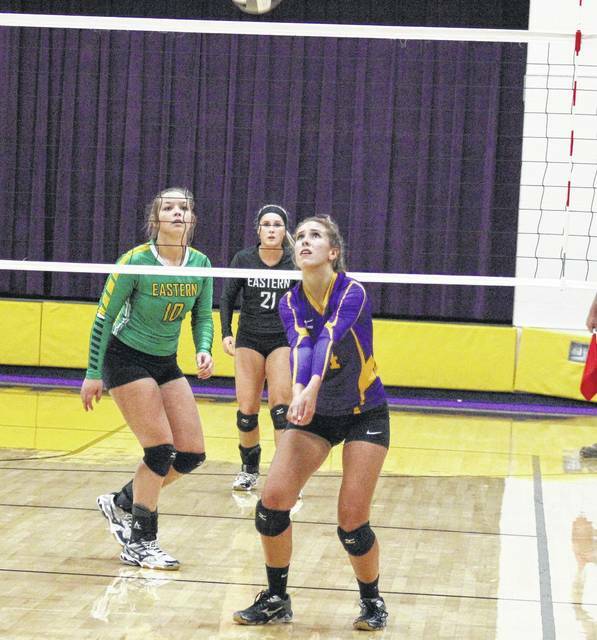 The Eastern volleyball team ended Southern’s 11-match Tri-Valley Conference Hocking Division winning streak on Thursday night in Meigs County as the visiting Lady Eagles took a 3-1 victory. Eastern (4-4, 2-1) led initially in the opening game, but Southern (3-3, 2-1) took the advantage at 5-4. The Lady Eagles regained the lead as part of a 15-4 run and never looked back en route to a 25-16 victory. SHS led 5-2 in the second game, but failed to record another service point in the game. Highlighted by 13 straight service points from Morgain Little, Eastern roared back to take a 25-9 victory and move ahead 2-0 in the match. After a pair of early lead changes in the third game, the Lady Eagles opened a five-point lead at 11-6. Southern fought back to tie the game at 11, and then tied it twice more before finally taking a 14-13. SHS led for the remainder of the third, taking the 25-19 win to force a fourth game. The Lady Tornadoes claimed the first three points of the fourth, but EHS took the lead with a 4-0 run. Southern regained the advantage at 7-6, but didn’t record a service point after that. Eastern took the lead back at 9-8 and never relinquished it on the way to a 25-14 win that sealed the match. Little led the Lady Eagle service attack with a match-best 25 service points, including four aces. Morgan Baer finished with 11 points and two aces for the victors, Allison Barber chipped in with seven points, while Kelsey Casto and Jenna Chadwell each had six points, including an ace by Casto. Mackenzie Brooks posted three points and one ace for the guests, while Sydney Sanders rounded out the team total with one point. The Lady Tornadoes were led by Jaiden Roberts with 13 service points, including a pair of aces. 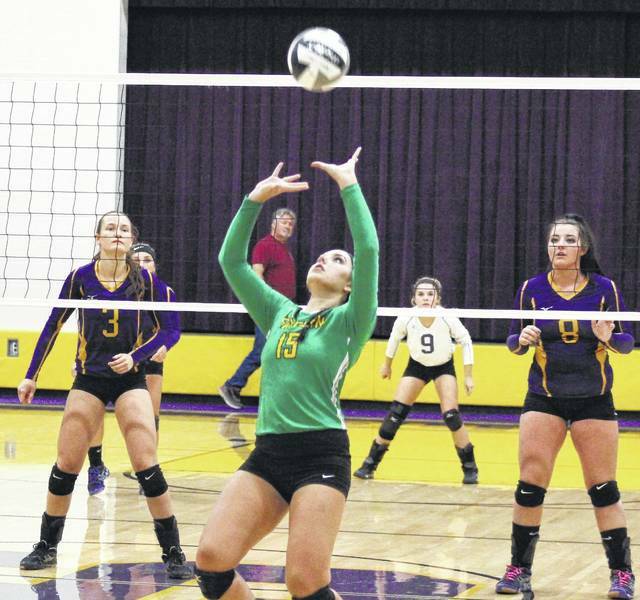 Marissa Brooker marked six points for SHS, Baylee Grueser was next with five points and one ace, while Jane Roush and Sydney Cleland both finished with three service points. At the net, Eastern was led by Brooks and Barber with 11 and 10 kills respectively to go with four blocks apiece. Baer posted four kills, three blocks and a team-best 27 assists in the win, Little added three kills and one block, while Casto finished with three kills of her own. Eastern’s defensive effort was led by Barber, with 20 digs. 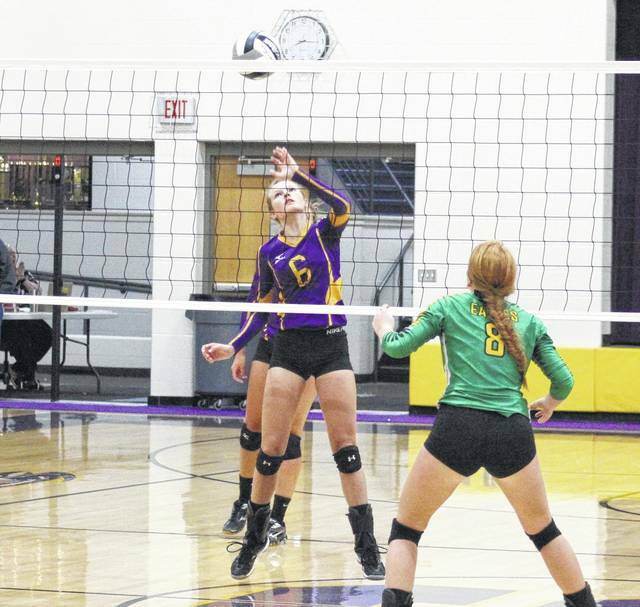 SHS sophomore Baylee Wolfe led the hosts at the net, posting a match-best 13 kills to go with a team-high two blocks. Jolisha Ervin had two kills in the match, Brooker added one block, while Phoenix Cleland, Abby Cummins and Kassie Barton each contributed one kill. Roush led Southern’s defense with 11 digs. These teams are scheduled to meet again on Sept. 28 in Tuppers Plains. After a non-conference tri-match on Saturday at Meigs, Southern will get back to work in the TVC Hocking on Monday at Waterford. Eastern returns to the court on Tuesday when Wahama visits Tuppers Plains. Eastern senior Morgain Little (12) spikes the ball over Lady Tornadoes Jolisha Ervin (8) and Baylee Wolfe (3), during the Lady Eagles 3-1 win on Thursday in Racine, Ohio. 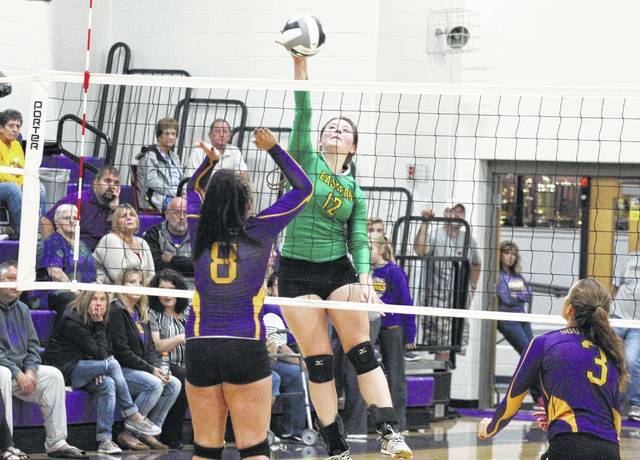 https://www.mydailytribune.com/wp-content/uploads/sites/42/2017/09/web1_9.10-EHS-Little.jpgEastern senior Morgain Little (12) spikes the ball over Lady Tornadoes Jolisha Ervin (8) and Baylee Wolfe (3), during the Lady Eagles 3-1 win on Thursday in Racine, Ohio.